Vega Baja, Puerto Rico - - Their stories are as compelling as the images, pictures united in despair. The old woman on the porch. She's hard to forget. She appeared when she heard their voices rising from the hill, coming closer and closer, people chanting and singing, calling his name, "Igor! Igor!" The old woman smiled. She heard the voice of hope. She yelled down to the man in Spanish, and Juan Gonzalez, the man known as Igor, bounded up the steps to greet her. He wore jeans and a long-sleeved white shirt, and he met the old woman on the concrete floor in the main living area. It was a room barely bigger than a king-size bed. The woman was near tears. She was desperate. Her sons had been up to no good, she said. Gonzalez embraced the woman, then, saying something in Spanish, gave her $200. On the other side of the street, in this part of an area known as Alto de Cuba, another man was watching. He's hard to forget. He wore a hat and a tattered brown vest. His name was Malele Hernandez. But around the barrio, he is called "The Magician." "Juan, he never forgets," Hernandez, 70, said in broken English. "When he was a boy, we got four people to go in. Together we buy him a ball. The ball costs 20 cents. Now he buys me dinner. "He told me one time he comes back because he wants to take care of his people. Many have almost nothing. But Juan Gonzalez, he is not ashamed of us." Say what you want about Juan Gonzalez, the Detroit Tigers' newest outfielder and former two-time American League most valuable player who was acquired last month in a trade with the Texas Rangers. Call him a whiner for boycotting last season's All-Star Game, refusing to play as a reserve because he wasn't voted into the starting lineup. Say he was a brat for skipping the ceremonial Hall of Fame exhibition game last summer because the oversize pants given to him made the 6-foot-4 slugger look like a circus clown. He will accept criticism for that, too. But challenge Gonzalez's social conscience, and be prepared to see a man swell with anger. First, the player who prides himself in knowing the mayors of all 78 Puerto Rican cities will lecture you on the relationship between giving and despair. Then, in a firmer tone, he will explain his view on the difference between concern and compassion. And Juan Gonzalez, the people here will say, is a compassionate man. That's why to know him, they say you must know Vega Baja. "You might have heard, someday I'm running for mayor of the city," Gonzalez said the other day, referring to Vega Baja, where he grew up. "I like politics. People love me here. The poor people here, the mayor forgets. Everybody forgets my neighborhood because you see a lot of drugs. But they are human. They need help. "Eight months a year, I am gone because of baseball. But they know if I didn't have this game, I would be a social worker. Giving to people is the song of God." Even now, more than a dozen years after he left Vega Baja as a gangly 16-year-old when he signed his first professional contract with the Rangers in 1985, Puerto Ricans still swoon over Gonzalez, 30. The feeling has been mutual in part, Gonzalez said, because his homeland and his family have been the most stable things in his life. An entourage from the Tigers' front office, which included manager Phil Garner, general manager Randy Smith and president John McHale, flew to Puerto Rico recently to see where Gonzalez grew up. He received his new Tigers uniform, No. 19, at a news conference for the local media. At dinner that night, Gonzalez treated his guests to a meal at an Italian restaurant. The evening began when one of Gonzalez's friends read a poem he had written welcoming their visitors from Detroit. "We had a wonderful time," Garner said. "We got to understand him better, and it also made me think. One of the bad things we've done in our society -- if people don't conform, we verbally beat the hell out of them. One of the great virtues we have in this country is that we have the freedom of disagreement. "Juan is from a different culture. There's no wonder you want to surround yourself with people you feel comfortable with." Though the late Roberto Clemente will always be the baseball patron saint of Puerto Rico, a commonwealth of nearly 4 million people, the Tigers learned that the love for Gonzalez is no less intense. Especially in the barrios of Vega Baja in the northwest part of the island, about 25 miles from San Juan. 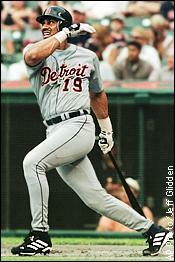 After Gonzalez won the American League home run title on the final day of the 1992 season, slugging No. 43 to bypass Mark McGwire, more than 100,000 people lined the expressway the next day to cheer his motorcade as it passed by. It was a day of overwhelming joy: Not since Orlando Cepeda in 1961 had a Puerto Rican led either league in home runs. Two years later, when Gonzalez's half-brother, Puma, was found dead of a drug overdose, Juan found comfort among the people of his neighborhood. Many told him they heard Puma died with a Bible under his arms. "I never lived with him together because of different mothers," Gonzalez said. "When he came back (from New York) at 17 years old, I met with him and talked to him. He was 4 years older, and I used to see him on the corner, using drugs and alcohol. I told him, Brother, when you walk with me, you walk clean.' But he had a lot of problems. He never came back to the real life. When he died, I cried because he was my blood." Gonzalez, who was born Oct. 20, 1969 -- the oft-printed date of Oct. 16 is an error, his mother said -- grew up on a narrow street called Sanchez Lopez, house No. C-17. The family stayed there until Gonzalez was 15, when his father, also named Juan and a retired mathematics teacher, moved the family to a safer barrio on the other side of the highway. The magician Hernandez remembers Gonzalez as a youngster, how he used to knock on neighbors' doors trying to find someone to play baseball with. Since there was no field or baseball diamond nearby, the boys played on the street or in the overgrown lot at the end of the hill. Equipment, such as baseballs and bats, was hard to come by, so Juan used to make his own balls by wrapping bottle caps with tape. Then he tried taping crushed paper cups. When he lost the homemade balls, he would sneak into his sisters' room, pluck the heads off their dolls and bat them down the street. "When he was 5 years old, an uncle gave him a glove," his mother, Lele Gonzalez, said through an interpreter. "That was the beginning. As a kid he was very obedient and very peaceful, a kid of the house. When he was young, he'd be sleeping at 7 p.m.
"I didn't make him go to bed that early; he didn't like to go out. He used to say, Momma, my dream is to become a major-league ballplayer.' I'll never forget the day he left this house to play pro baseball in the states. Everyone in this house cried. He cried. I cried. Even the cat we had cried." When Gonzalez visited his old street recently, two hours after putting on his Tigers uniform for the first time, he took his visitors to a basketball court he built six years ago on Sanchez Lopez. Protected by a high fence, the lime green-and-yellow court is devoid of trash -- the cleanest piece of land in the barrio. It also serves as a kind of neighborhood town square whenever Gonzalez, who now lives about 20 minutes away, comes into town. During the week he made headlines in the Puerto Rican tabloids because of his loss in a paternity suit -- which fueled the recent separation between Gonzalez and his current wife, merengue singer Olga Tanon -- Gonzalez bought 200 turkeys and organized a Thanksgiving buffet on the court for the neighborhood. In two weeks, children of the barrio will receive gifts at his annual Christmas party on the court. Last year, he bought nearly $5,000 worth of toys. For many, it will be their only Christmas present. "Juan is a terrific friend -- he and I helped raise each other," said Josue Salva, 35, a member of the 1987 Puerto Rican national baseball team. "He just gives -- even to those who don't ask." Citing an example, Salva reached in his pocket and took out an envelope. It was an early Christmas gift from Gonzalez. Inside was the receipt for a 10-day Caribbean cruise he had purchased for his friend. Luis Mayoral, the Rangers' former Spanish radio broadcaster and Gonzalez's confidant, was hired recently by the Tigers to be their Latin American liaison. He said Puerto Ricans admire Gonzalez not only because he is an excellent hitter, but because he can "identify with their struggles." "That's why he gives away so much of his money," Mayoral said. Gonzalez will make $7.5 million next season with the Tigers and then can become a free agent, but the team hopes to sign him to a long-term deal. Emphasizing that Gonzalez is not careless with his money, Mayoral explained that he has invested his money with Smith Barney since 1994 and is "set for life." Juan just has an angel on his shoulder," said Mayoral, 53. "That's why he feels the need to give." In Vega Baja, Gonzalez is honored daily in the form of shrines made of baseball cards and photographs bearing his likeness. Most are displayed next to pictures of the Virgen de Guadalupe to ensure their national hero will be protected, shopkeepers said. In one storefront window covered by a steel gate, framed pictures of Gonzalez and Ivan Rodriguez, a former Rangers teammate, hang near a display of children's toys. Gonzalez's photo is above a symbol of the current Pokemon craze among kids -- a stuffed yellow Pikachu. Rodriguez, the current American League MVP (Gonzalez won the title in 1996 and '98), grew up a few blocks from Gonzalez in another section of Vega Baja. But he isn't as popular there, Mayoral said, because he doesn't visit Alto de Cuba as often as Gonzalez does. "Juan is 10 times more popular than Pudge here," Mayoral said. "But in the states, Pudge might be more because when he sees the cameras, his eyes open up. Here, it is this way: Juan is king. Not Bernie Williams, not Edgar Martinez, not Pudge. It's Juan. No ballplayer reaches up to his knees here, even with all the tabloids and publicity." Mayoral is referring to the recent reports of the separation between Gonzalez and Tanon. The marriage, his fourth, supposedly failed when Gonzalez acknowledged in court last month that he is the father of a 4-year-old boy, Igor. Gonzalez had an affair with Igor's mother before his marriage to Tanon. Gonzalez has two other children -- 7-year-old Juan, known as Jay Jay, who lives with an ex-wife; and 3-year-old Gabriela, whose mother is Tanon. He supports the children and said he sees them regularly. Gabriela and Jay Jay will be in Puerto Rico later this month for the holidays, he said. Asked if he hopes his marriage to Tanon can be reconciled, Gonzalez looked down and shook his head, saying: "Right now, I don't like to talk about it. That situation, it's too private." Gonzalez said he has become a Christian and has asked for forgiveness. He said he had the revelation a few months ago. "I have everything -- money, good cars, apartment, houses -- but I was lonely," Gonzalez explained. "When I accepted Jesus Christ in my heart, I felt more true, more power inside myself. "Before, I like women, you know? But right now, with God to help me, I don't need any more women." Until the trade, Gonzalez said one of his favorite things about Detroit was Sara Simpson. Simpson was the longtime elevator operator at Tiger Stadium. When he visited her last summer, on a hot and humid day when the Rangers were in town, he saw that Simpson was sweating profusely. "The elevator was a sauna, too hot for Sara," Gonzalez said. "The next day, my wife and I went to the shopping mall, to the place with fans. I said, lease give me a nice fan.' We gave it to Sara. I never forget Sara." Funny thing about that road trip, too. When he was in right field during one of the games, he remembers acknowledging a group of fans who kept cheering his name. He never knew it would be a prelude of things to come. "When we played there, people were yelling: Hey, Juan, stay here! Come here! Come here! New stadium!' " Gonzalez said. "Now I am going there. I think there are fans in Detroit who will like me. I want them to know that I play for them now. "When I was traded, it was a shock for me because I played all my life for the Rangers. But when I received the bad news, I thanked them for the opportunity. I understand this game. This game is a business. But I know I have to go to a new home. I have to start with my new family. I want them to know they will like Juan Gonzalez." Tigers fans might like to know that Gonzalez already has begun working out with his personal trainer. When he comes to Detroit in late January for a banquet, it will be his first visit as a Tiger. He already has a list of goals, beginning with improving his statistics from last season, including his .326 batting average, 39 home runs and 128 RBI. Gonzalez called his performance below average. Though he has been plagued with wrist and back injuries during his career, he has another goal of playing in more than 154 games -- the number he played in 1998, his second MVP year. That season Gonzalez hit 45 homers, drove in 157 runs and batted .318. "I want to play for seven or eight more years," Gonzalez said. "I'm working so hard and my goals are so big. I'm looking for 45 homers for the Tigers, 140 or 150 RBI and hitting 3-something. "I know I have a big weight on my shoulders, but a team is 25 members, and I am only one Juan." The other day, when Gonzalez took Smith and a group up the hill past the old woman's house, they entered the lot where Gonzalez used to play. It is littered with refuse now, including the rusted shells of abandoned cars. "This is where it all started, huh?" Smith asked. "Hard," he said, "but not impossible."